two galleries, swimming in a rooftop pool, and tea with george. – teamgloria, inc.
two galleries, swimming in a rooftop pool, and tea with george. Posted on November 27, 2011 by teamgloria in people., places., things. after brunch – and the saturday FT read cover-to-cover (yes, in print, darlings) – at Chateau Marmont (see earlier post), we still had a little while before we could check into the Chamberlain Hotel, so we drove down La Brea to see a couple of exhibitions. Mark Shaw photographs at Swedish design and furniture store, Svenska Mobler (gorgeous 1950s Dior couture gowns and models in pale slipper pinks and blues smiling archly at the camera – ah, those were the days). then to see Ellen Von Unwerth’s show at Fahey Klein. confession: ***in a former life (not literally, darlings, using that as a metaphor for the many chapters in la vie de gloria), we worked with Ellen Von Unwerth (really! )…..it’s a very short (but good) story for another time. but all we can say is that it was London and there was glitter (the sort you put on frames, not faces) and it was Very Glamorous on opening night. she was charming (but has a very impenetrable accent so we mostly nodded and tried to decode what she’d said afterwards to be honest). 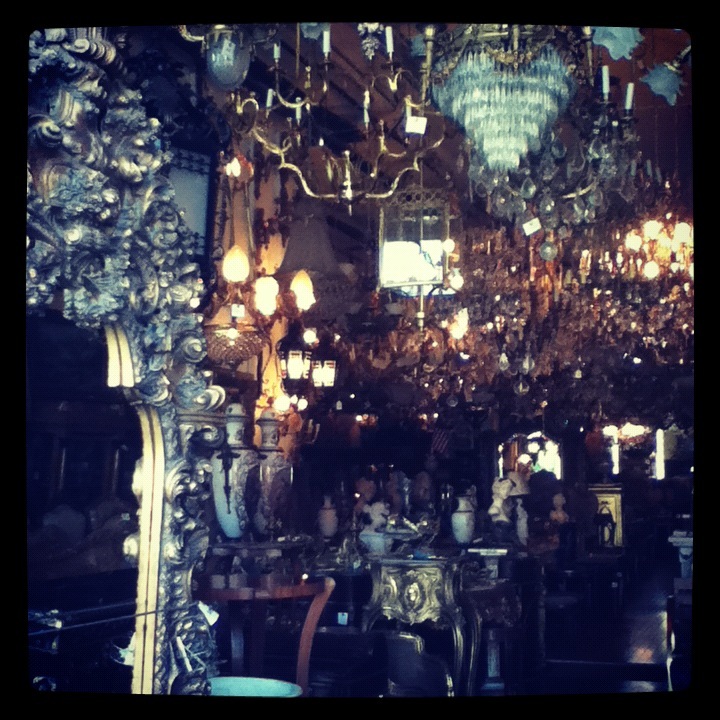 insider tip: if you want a chandelier (and you know we Adore a Chandelier), La Brea has Tons. finally it was Time to Check in. (have you noticed we’ve been Rather Sociable on this trip? staying with AH near the Ocean on sunday/monday – then to Palm Springs to stay with GB + Z – and then back to L.A, more correctly, to Silverlake to stay with @tjenamoss/MN). it’s the post-surgery-gloria-ness. not only are we Not Quite ourselves (energy, mood, tears), but we’ve discovered it’s rather Nice to stay with people (just a couple of nights, we know our – and their – limit to stay within the bounds of etiquette). late night chats and morning tea and wheat-free toast in the kitchen and making plans and watching movies and television and walking and sharing experiences are actually Lovely. but now we’re down to the final couple of days of our vacation and so decided a weekend in our favourite/favorite/beloved hotel to swim – read – write – sleep – smile – breathe – drive – would be a Splendid idea. and they have a splendid POOL on the ROOF (bliss). so we unpacked and grabbed a long linen shift and our large Jackie O glasses and flip flops (with a little wedge for that illusion of height) and climbed the stairs to the rooftop-ness and swam for several minutes with a large smile on our face. we swam and then headed back downstairs as we had Tea With George at 4pm. oh. it was lovely to see him. particularly as he had gifts for us (we Adore a Parcel)! here’s the back of the t-shirt……….saucy, no? we are not a big t-shirt wearer so we’ve decided to hang it in the closet, in SoHo, and ask friends to model it when they come round and we’ll photograph them for you. George has finished his second novel! and it’s now available (hint, darlings) to purchase on Amazon…. as we’ve mentioned before, there’s a lovely cameo by a character called Celia. at our lovely tea this afternoon, George assures us Celia returns for book 3 (in fact George is already entwined in the Most Fascinating and scarily-close-to-reality’s-twists plot points). Celia, if you recall, is a most elegant Brit, with a big Day Job in, you guessed it Manhattan. such a seductive little cameo. we Can’t Imagine where George got the inspiration for That Character, darlings. we are now nestled into the high thread count sheets in our quiet room at the Chamberlain (the male models are obviously out “clubbing” we hear not a peep on our corridor) and guess what we’re reading? Next Post 8am: sunday morning: poolside. In truth, you have been a Perfect Fiend to leave us for so long. We are all breathlessly awaiting you here in NYC. Less fair and a few more freckles (scar covered up modestly;) after a Morning By The Pool. Am almost ready for a NYC l’hivre.